Very few artists stay at the top of their game for their entire career. 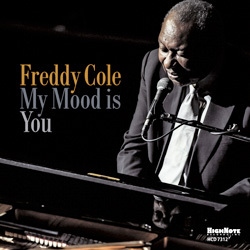 However, Freddy Cole’s velvet unhurried singing style remains every bit as cool and hip as it was when his first record was released in 1964. Pianist John di Martino, bassist Elias Bailey, guitarist Randy Napoleon and drummer Quentin Baxter, are trusted associates of Cole who respond to his inimitable sense of swing with now intuitive assurance. Guest saxophonist Joel Frahm displays a sympathetic style that puts him in league with such earlier illustrious Cole saxophone allies as Houston Person and David “Fathead” Newman. Time has been kind to Freddy Cole, who is currently singing with the vitality and zest of a man half his age. His seasoned voice is as affecting as ever, his understanding of a song's expressive anatomy never more incisive. His unimpeachable artistry, rather than longevity, is what positions him as today's vocal jazz master.